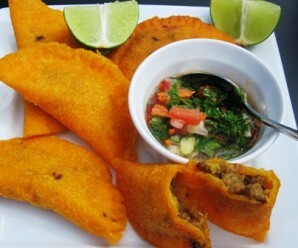 Carimañola is a traditional dish from the Caribbean region of Colombia. 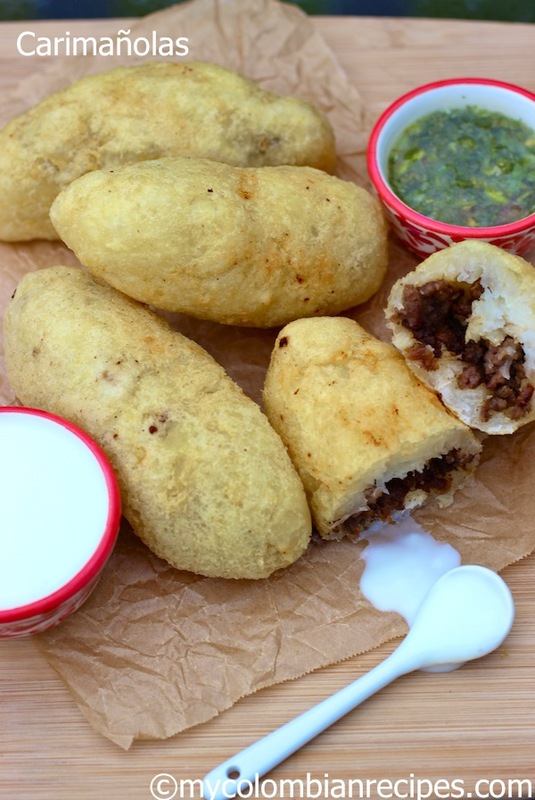 It is a yuca fritter stuffed with meat, or cheese for a great vegetarian version. This dish is also popular in Panamá. 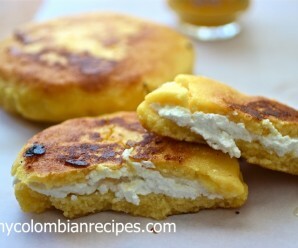 I usually don’t like to eat fried food, but once in a while I crave my Colombian fritters. 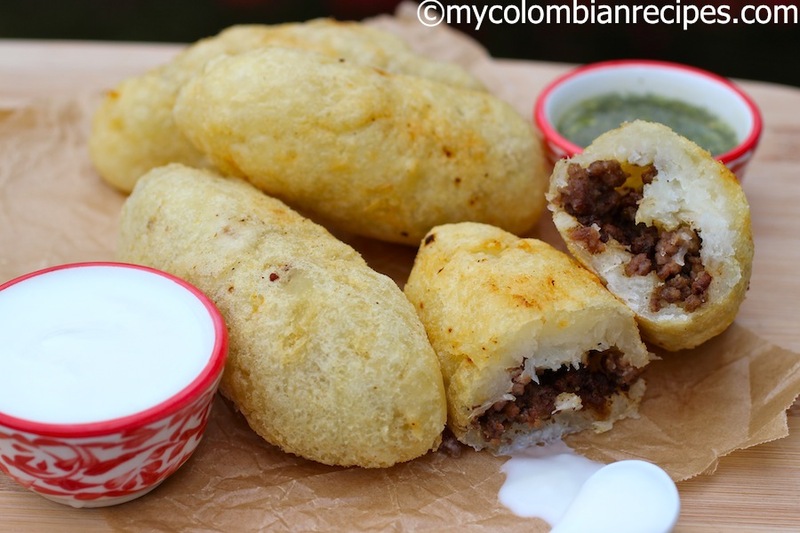 Since I have to blog about Colombian cuisine, which includes all these fantastic fritters, I have the perfect excuse to eat them. 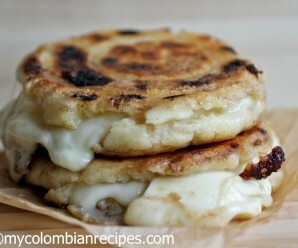 :)Carimañolas are delicious with suero Costeño or ají! Try them. In a large pot place the yuca, salt and enough water to cover. Bring to a boil, then reduce the heat to medium and cook for about 15 minutes or until fork tender. To prepare the meat filling: In a large skillet, heat the oil over medium-high heat. Add the onions, red bell pepper and cook until soft, about 3 minutes. Add the garlic, scallions, cumin, salt, black pepper and cook for about 1 minute, stirring often. Add the ground beef and cook until the meat is cooked trough, about 7 minutes. Add the tomato paste and cook for 2 minutes more. 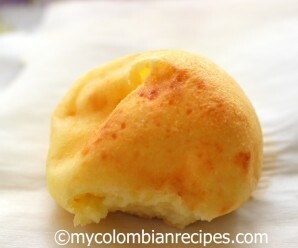 To make the carimañolas: Divide the yuca mixture into 10 balls. Make a hole through the center of each ball with your finger. 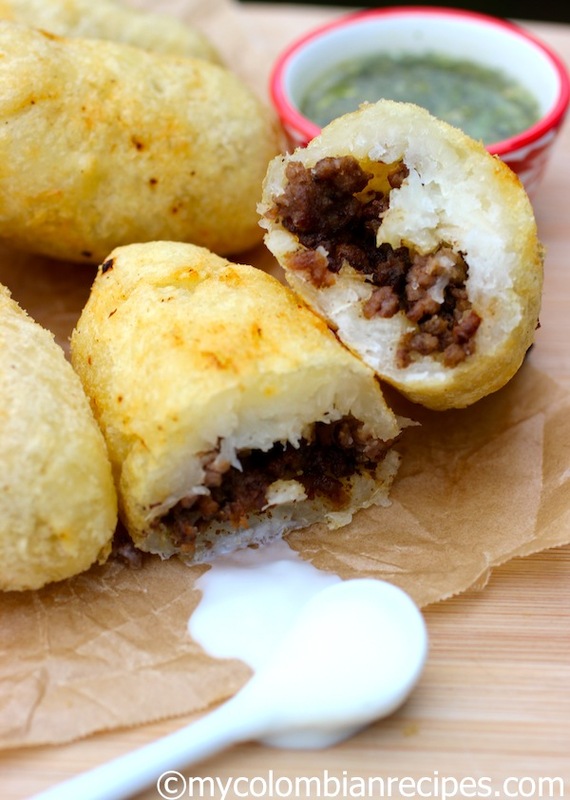 Place about 1 tablespoon of meat or cheese filling and gently close the ball, giving an oval shape. In a large pot heat the vegetable oil and heat to 350° F. Add the carimañolas to hot oil and cook about 2 to 3 minutes until golden brown, turning them often. 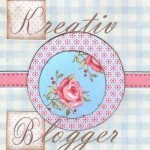 I received this award from Sophie of “Sophies Foodiefiles”. Thank you so much Sophie for the recognition, I really appreciate it. oh wow do those look good. I’ve never eaten yucca, but the filling alone sounds so tasty! I try not to eat to many fried foods too. My neighbor has a yucca plant in his front yard; I wonder if he’d miss it! Kidding, I’m just kidding! Hey Erica — I bet after step #6 you could do these in the oven with similar results. Definitely a keeper! I want to make them NOW! But it’s almost midnight. So, I have to wait for another day. I love Yuca! Those yuca fritters are just scrumptious! Love the filling with meat & cheese! Waw!!! These stuffed balls look truly fabulous!! I so want to savour at least 3 of them! Again congrats on your award!! You deserve it! delicious!! love the stuffings in it!! Thank you all so much for your comments!!!!! OH MY GOSH YOU HAVE SAVE ME A LOT OF MONEY MY KIDS EATS THESE OFTEN THANK A LOT . Hi, I was gifted with two bags of Toasted Manioc Flour today. I see this recipe uses fresh Yucca. Do you have any recipes for Toasted Manioc Flour? There has got to be more then one way to use this. The only recipe I can find is for Farofa. 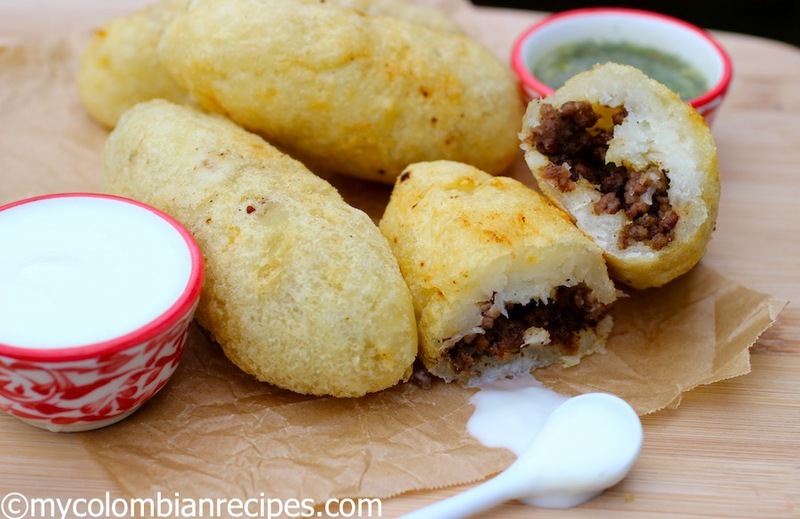 I’m from the Caribbean region of Colombia, and trust me, the carimañolas would taste much better if you add minced garlic to the yuca dough and mix thoroughly. Mmm…Yummy!!! Carimanolas!!!! My mother used to make these all the time. I had forgotten how to make them. Thank you! I love your recipes, they remind me of my mami and make me laugh out loud and cry at the same time. 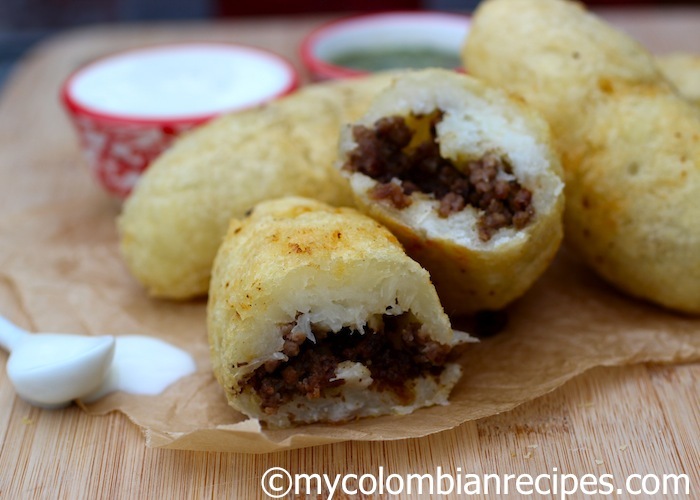 I am from Panama and we eat carimanolas all the time….I have never thought it was so easy to make them without the molino…thanks for your recipes…even though they are from Colombia they remind me so much of my country food, which always I wanted to make so bad, but I was lost either in translation or cooking methods. Thanks again!! !